Strategic Workforce Planning is a process that ensures that your business has the right people in the right jobs at the right time to achieve your expected results. This discipline helps organizations understand their current state, forecast talent gaps, and take the necessary steps to close those gaps. It is a core business process that is often handled by the HR department, but it is so important to the success of a business that its leaders should approach the process proactively and take ownership of it. Start planning long-term success today. We’ve all heard the saying that "failing to plan is planning to fail." The traditional strategic planning process often focuses heavily on large capital expenditures, technology, and marketing investments. But the traditional process focuses too little on the organization and the human resources necessary for sound execution. It is almost as if the business takes for granted that it already has people with the necessary capabilities. The truth is that it can take several months, if not years, to get the right people in the right jobs, and this can seriously hinder the execution of even the most well thought out strategy. We polled our experts and asked them to define a simple, straightforward strategic workforce management process. What does this changing strategy mean for the business? This is a crucial question that must be understood at the executive level, the business unit level, and the front-line operational level. Strategic change fails when the people implementing the change don’t know what they need to do differently in order to support the new strategy. These disconnects create confusion, conflict, and stress, and put even the best people in a position to fail. Make sure that you have thought through the operational details of your strategy, and that you have sufficient facts and support to make a good decision. Know how far and how fast you can reasonably move. It takes time, money, and thought to design and build technological infrastructure, production facilities, and distribution capability. Similarly, it takes time to source, deploy, and train talent. This is even more true when your workforce requires special skills or credentials, or when your jobs are located in a talent-poor or highly competitive region. The bottom line is that you need to know your business strategy, and the impact of that strategy, before you can create a meaningful workforce plan. Understanding the labour market for the jobs necessary to drive your strategy will help you better understand the length of time it will take to fill a job, the salary you should expect to pay for the job, and potential challenges to filling the job. For example, maybe there is a need for a new school in a growing suburb, but the area is expensive and it is difficult to attract teachers. You need to take these factors into account as you build your SWP. Macroeconomic forecasts—A vibrant, growing economy usually increases demand for talent and raises the cost of employment. Conversely, a challenging economy often increases the supply and affordability of even the very best talent. Demographic trends—The age of the available workforce can be an indicator of the capability and availability of workers in an area. Therefore it may be desirable to locate a technology business near a college town as opposed to a retirement community. Regulatory changes—Think about what would happen if the US government suddenly offered universal healthcare. People who work for larger organizations because of the health benefits may choose to enter business independently, thus changing the employment mix. Talent movement trends within your industry—Who’s moving, where are they moving, and why? This can be driven by many external factors such as better job security, better pay, or the opportunity to do the most interesting work. Once you have translated your business strategy into operational requirements, you must design the organization and the jobs necessary to implement the strategy. If you contrast this with your organization and jobs as they stand right now, you can identify jobs you will need to create, jobs you will need to phase out, and the optimal timing of your transition. As with most forecasting efforts, identifying talent demands can be part art and part science. We need to make certain assumptions when we develop our business strategies, and the further ahead we plan, the more uncertain those assumptions become. Rather than getting bogged down in the minutiae, we recommend first focusing on critical roles and employee segments. Critical roles are those jobs that are vital to your future business strategy. If you don’t have a solid plan for filling these roles with capable people, the business strategy simply won’t come to life. For example, a new cardiac ward in a hospital needs cardiologists and acute care nurses in order to function. Critical employee segments can include mature workers, visible minorities, members of Gen Y, ethnic groups, veterans, aboriginals, and others. They can be strategically important to certain organizations that need to fulfill requirements for certain types of government contracts or grants, or that want to meet the needs of key customer groups. For example, if a retail organization wants to position itself in areas with growing Latino populations, then they need to have Latino employees. Who’s on first? What’s on second? Once you understand future demand, the amount of change needed, and the optimal timing of that change, you should inventory your current talent pool. This will help you determine how to eventually transition people into new roles. It will also give you insight into who won’t fit into the new organization and help you create an exit plan. How well will the worker "fit" the new job? You need to know if she has the behaviours and interests to be productive in the job. For example, if the new job requires her to think more strategically and less tactically, does she have the DNA and the desire to make that leap? If she doesn’t fit well, you might be able to place her in a different job that fits her better. Will the worker have the skills to perform the new job? It is much easier to teach skills than to change behaviours. However, you need to know what skills the learner needs to acquire and how long it will take to acquire them. This helps you focus your training investments most judiciously. There are a number of very effective assessments to help you answer these questions. How is talent currently moving in your organization? You need to understand how long talent stays in your organization. This can be accomplished by analyzing demographics to identify who is nearing retirement and when they might retire, and by understanding your voluntary and forced attrition. The age-old strategic planning questions: What? When? and How? Once you have assessed your internal talent inventory and understand the jobs necessary for executing your new strategy, you can identify your gaps, determine a time frame for closing those gaps, and create specific tactics for closing gaps. Build: Developing your internal talent helps you build a cohesive culture and sends a strong message to your people that you are committed to them. It also mitigates risk since you know the employee, the employee knows you, and the transition can be relatively quick. Bounce: Redeploy talent from obsolete or redundant jobs, as well as people who don’t fit well with the new jobs that they may be qualified to fill. This can also mean bouncing the employee from the organization altogether. Buy: Recruit outside talent. This can be expensive, slow, and risky. Recruiters are often involved, the process may be long, due diligence takes more time, and it is still difficult to predict whether the outside hire will be successful in your organization. 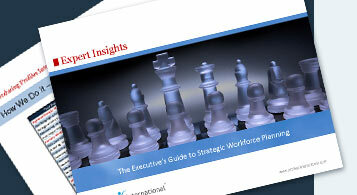 Strategic workforce planning is a process, not a one-time event. Like other business processes such as Total Quality Management (TQM) or 6-Sigma, SWP requires a continuous improvement mindset. By standardizing our approach to a very important and challenging business problem, we reduce errors and better understand the factors that drive success. This ultimately reduces costs and increases effectiveness. Secure top-level executive sponsorship. Although the name “strategic workforce planning” is bound to get the attention of the HR department, its scope far exceeds the mandate of most HR departments and even senior-level HR executives. HR can facilitate the process, but the business and functional leaders need to be intimately involved in order to ensure that their needs are met. If they lose confidence in the process, they will resist it. Don’t attempt to swallow the entire elephant at once. As we mentioned, SWP is a process that reaches broadly within an organization and requires a continuous improvement mindset. It is best to focus on the critical roles or most significant pain points first, and build positive momentum through quick wins. Use focused pilot projects to learn how the process will work in your organization before expanding the scope. Establish and track leading metrics. Inspect what you expect, starting with a few key metrics. Start simple and stay the course. This discipline will help you make informed decisions that maximize benefit to the business.